Valentine’s Day is one of the most popular days of the year to propose, and fortunately Carden Park is on hand for anybody planning to pop the most romantic question of all, with its passionate ‘Proposal Plate’ menu. A memorable evening at Carden Park’s award winning Redmond Restaurant is guaranteed, with an unmatchable romantic ambience and exquisite ‘Proposal Plate’ dinner that promises to make the moment special. Starry-eyed diners will start with either a Chicken liver parfait in truffle butter with toasted brioche, red onion marmalade and radish salad or Poached pear with blue cheese, baby gem lettuce, grapes and walnuts. The choice of main is either Pan-fried sea bass with seaweed aranchini, baby leeks, citrus puree, chestnut and sea purslane or Roasted fillet of pork and glazed cheek with a polenta cake, carrot jam, poached Yorkshire rhubarb, black cabbage and jus. And a wonderful dessert will be accompanied with the big question. Will you marry me? Anybody looking to make their significant other the happiest person in the world, should call Carden Park’s booking team and request the ‘Proposal Plate’. 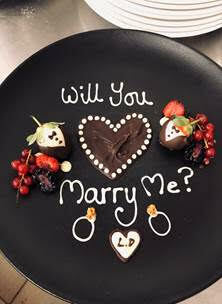 Of course, the ‘Proposal Plate’ is also available to any married couple looking to relive the magic of their proposal. The menu is available from the 14th – 16th of February for £65 per person. To book call 01829 731007 or discover more ideas at our Valentine’s Inspiration page.